It was a sunny and warm day. We parked in the Home Smith Park parking lot at the west end of the Old Dundas street bridge. We don’t normally go searching for anything specific when we hike but today was an exception. While researching John Scarlett and Scarlett Mills last week I learned about a friend of his named Thomas Fisher and the mill he built on the Humber just below Lambton Mills. So we set out to see what legacy of Thomas Fisher remained. Thomas Fisher came to York in 1821 and in 1822 he leased the King’s Mill (Old Mill). Under Fisher it prospered and expanded and he bought it from the government in 1834. In 1835 he sold it and moved a little north to his own lot where there was an excellent mill site about half a km below Dundas street. The parking lot is just above the west bridge abutment from the Old Dundas Street bridge. 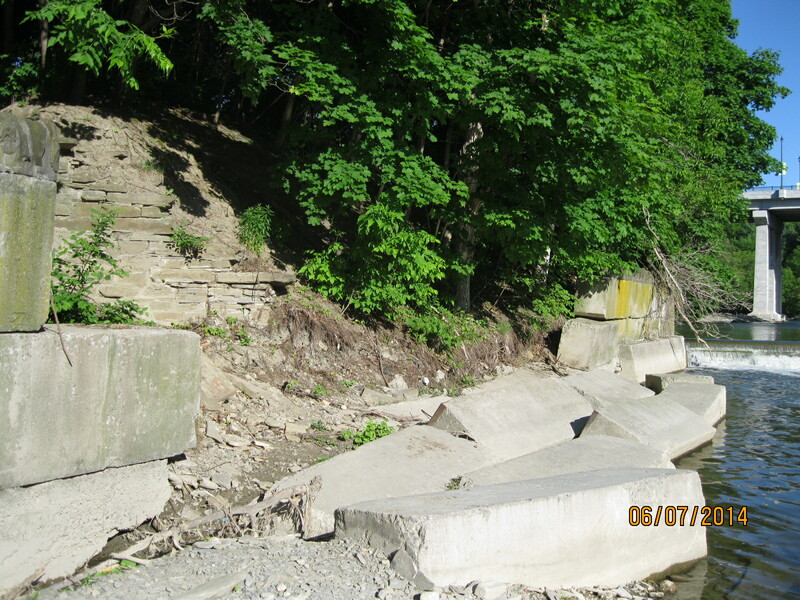 In the picture below an entire section of the bridge abutment and roadway is washed out by the flood waters after Hurricane Hazel swept through. The old abutment has been revealed at the left of the picture now that the new retaining wall has collapsed into the river. The first Millwood grist mill was a two story wooden mill and it burned down in 1847. Fisher replaced it with a five story mill. The lower two floors were made of stone and the upper three of wood. The mill had three runs of stones and ground wheat, oats and corn. Fisher built Millwood House on the top of the embankment above the mill. He also built stables, a store and living quarters as well as an access road to the hill top. In 1880 Millwood became Lambton Woolen Mills and was converted to steam power. It burned down and was abandoned around 1900. We followed the river looking for evidence of the old mill. We found no trace of it and concluded that it must have been removed when the park was developed. We followed the animal trail along the top of the hill looking for the access roadway that would have linked the mill with the house up top. 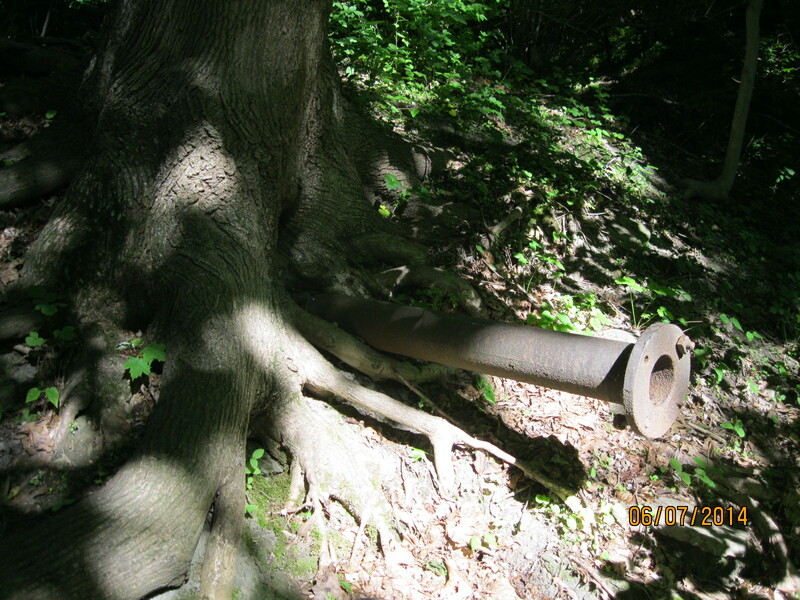 Along the side of the hill we found this big pipe sticking out of the ground with a large tree growing over it. It is likely related to the steam operations at the mill. Below this pipe we able to see the clear outline of a curved stream bed. Thinking this could be the mill race from the old mill we descended the hill. A mill race is a diversion stream from the mill pond where the miller can control the flow of water over the mill wheel. 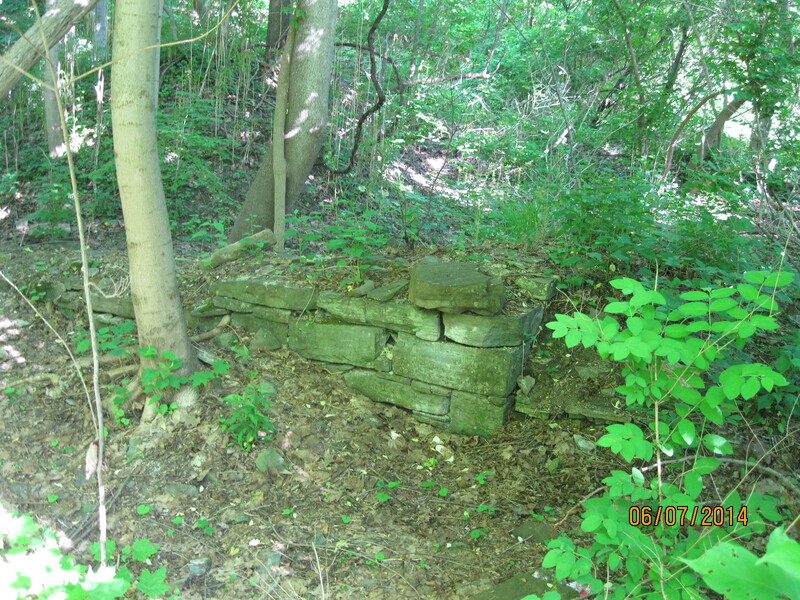 When we reached the bottom we found the 166 year old foundations of Millwood Mill hiding in the trees near the modern washroom facility. The outline of the old mill, which was 40 feet by 45 feet, is clearly visible as all four corners of the building can be easily located. 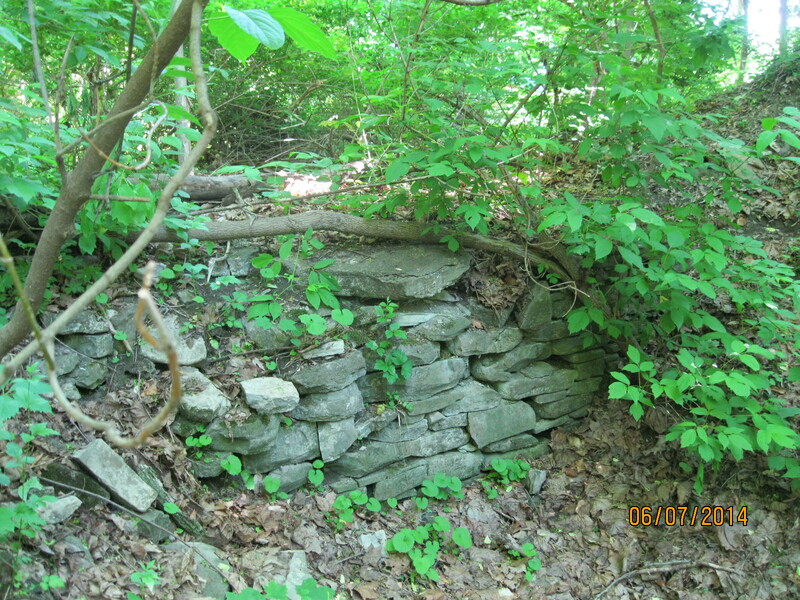 The outer south east corner of the foundation wall. 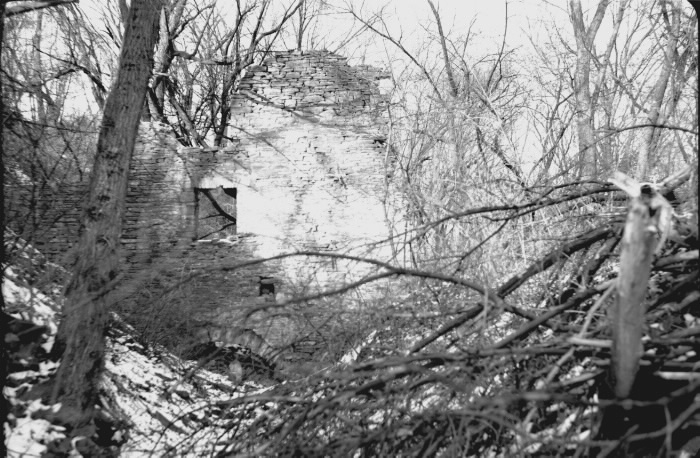 In the mid-1950’s there were still partial walls standing at the site of the old mill as can be seen in this archive photograph. We followed the ravine on the back side of the mill race and found a flat roadway, wide enough for a horse and cart, leading slowly up the side of the hill. 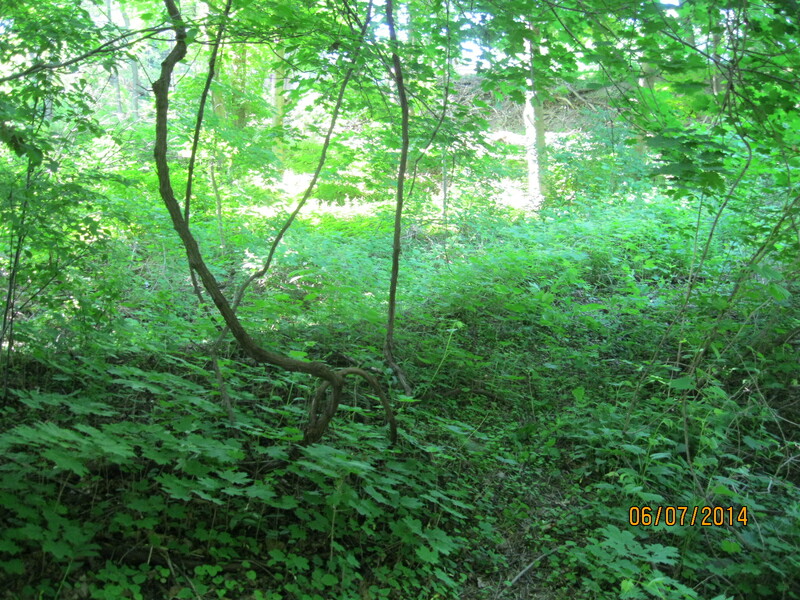 This appears to have been Fisher’s roadway between his home and the mill. Having explored here we returned to the Dundas street bridge and went north on the west side of the river. Just north of the new bridge we found the curved wall of earth that marks the retaining wall from the old mill pond for Lambton Mills. It appears as the straight line in the middle of this picture and is quite an extensive earthen work. Farther along this embankment we found a lot of old garbage. There was a food bottle from 1948 and the bottom of a 1952 Pepsi bottle. 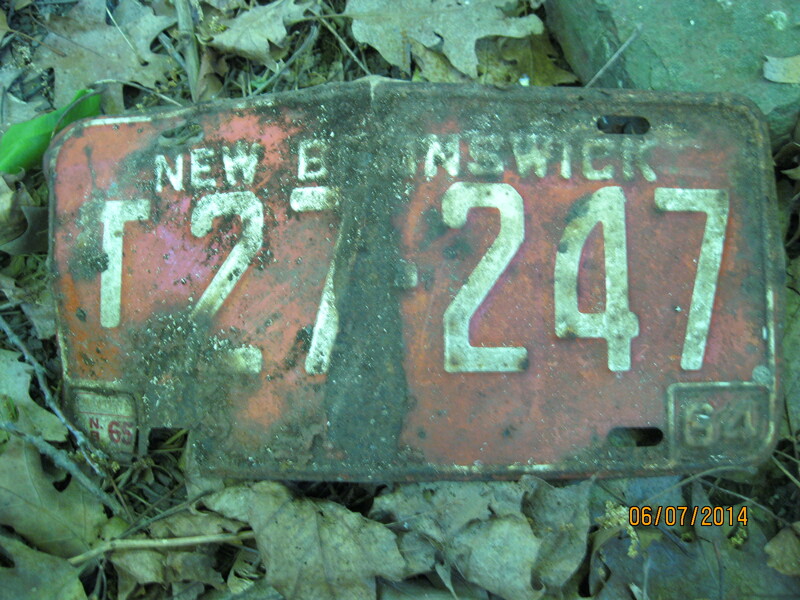 This 1964 licence plate from New Brunswick seems to be rather far away from home. Later we found the neck of a Caufield Dairy bottle. Caufield dairy was a local dairy operated off of a farm in the Albion and Weston road area. The farm was sold to developers in the 1950’s. 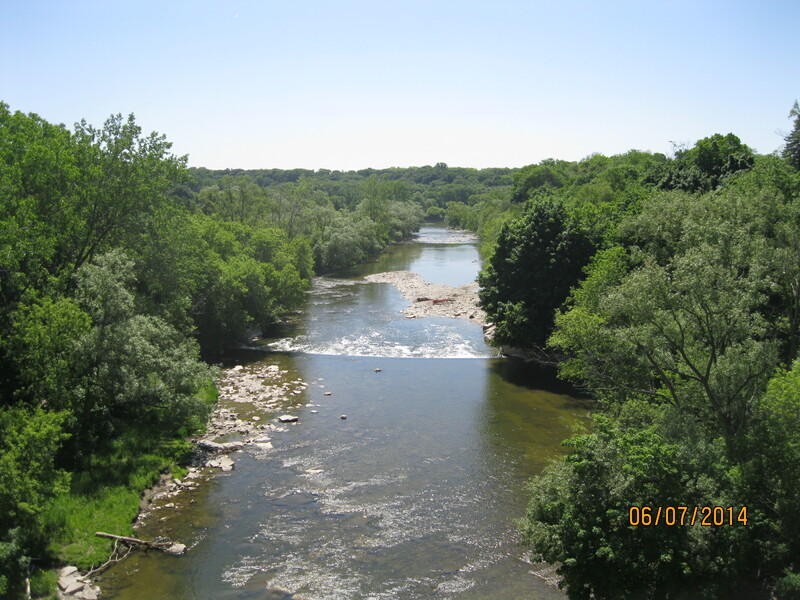 This view is the Humber River from the new Dundas street bridge looking south toward Lambton Mills. 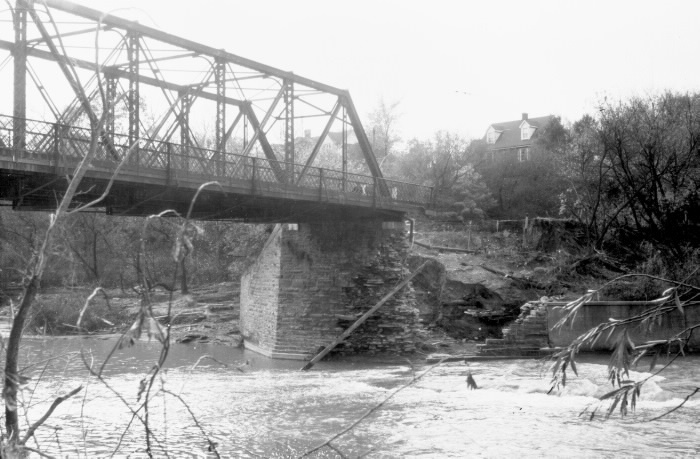 The first water fall in the picture is the site of the old Dundas Street Bridge and was where Cooper located his mills on either side of the river. This entry was posted in Hiking GTA, Humber River and tagged GTA, Hiking, Humber River, Toronto on June 8, 2014 by hikingthegta.